About Us: We are located in the beautiful Pineywoods region of East Texas. 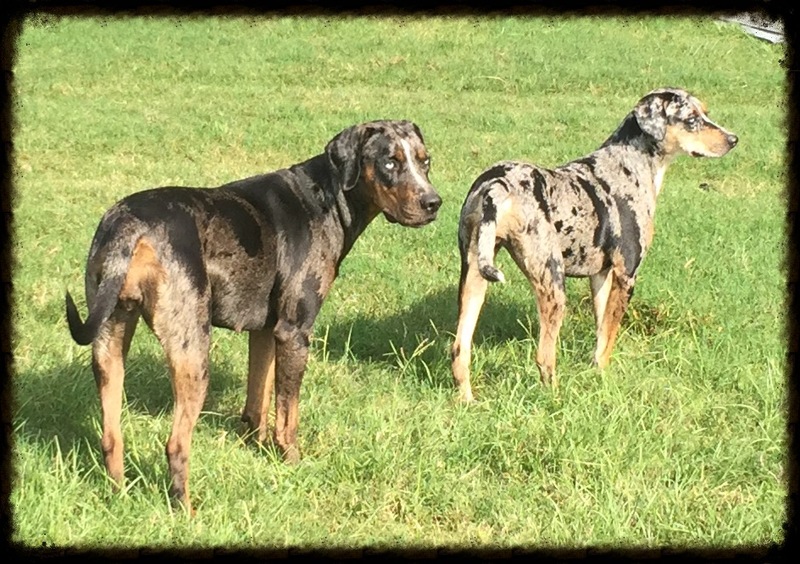 We are NALC Certified Breeders who acquired our first Catahoulas in 2012 and begin showing with NALC in conformation in 2015. We have owned several different breeds throughout our lives and while each breed has it own qualities, we have found that the Catahoula has every quality and requirement to match our lifestyle and fulfill our needs. 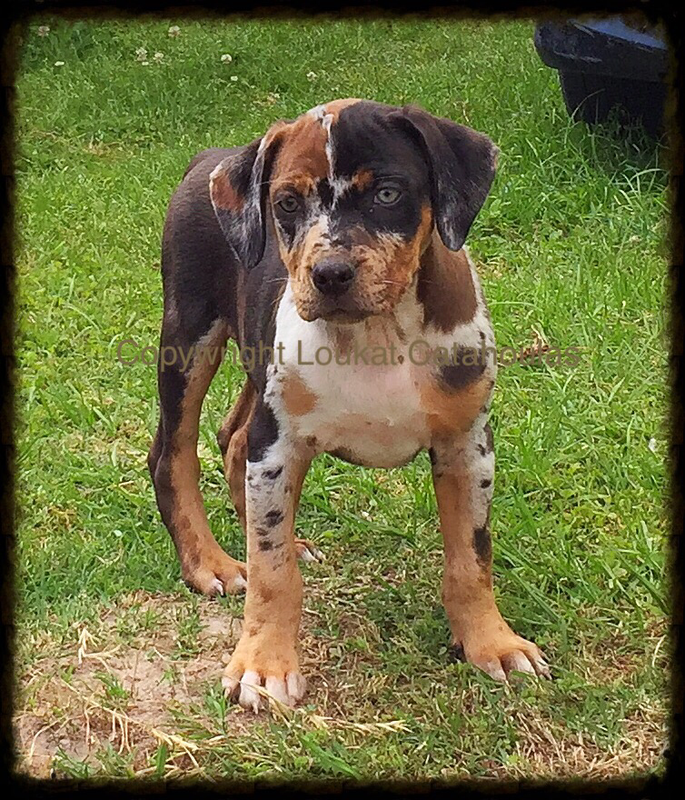 We strive to improve our knowledge and experience of the breed in order to provide quality puppies to people who desire a dog with the characteristics the Catahoula is known for. 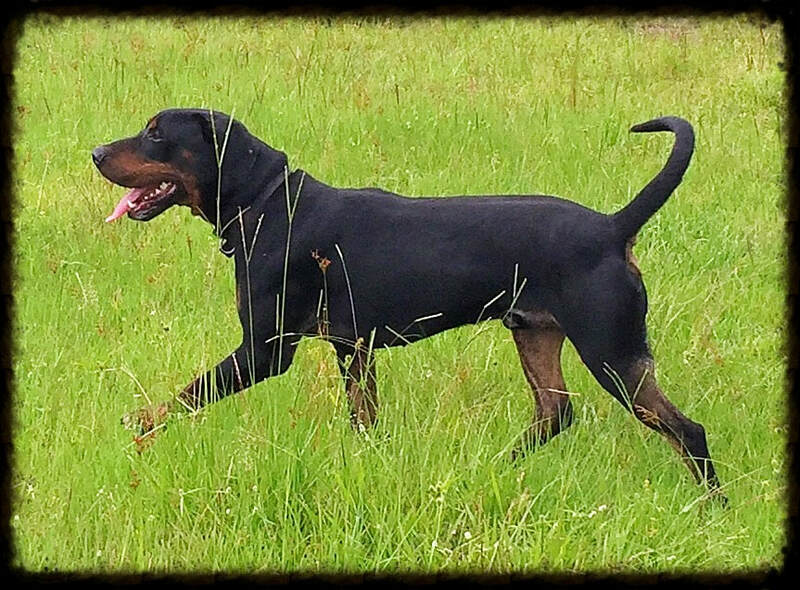 We breed for intelligent dogs with good conformation, and a strong working drive and we continue to research bloodlines to add to our breeding program that will enable us to achieve this goal. 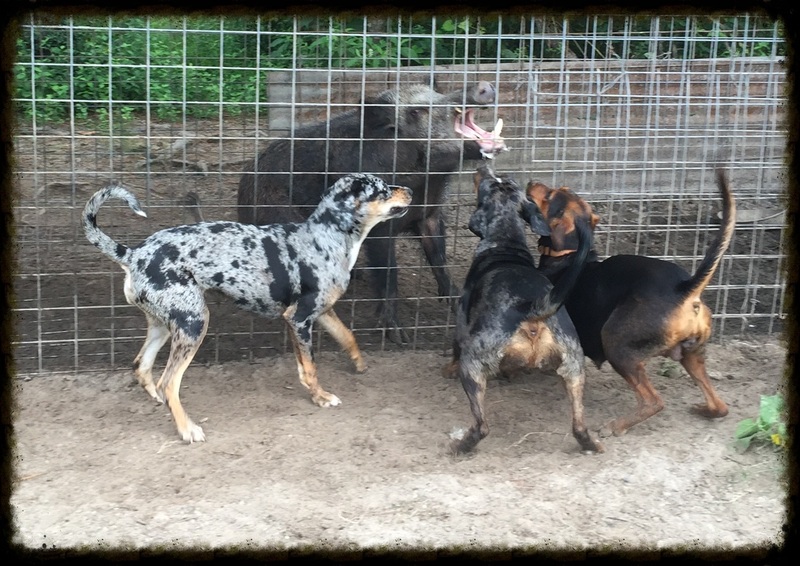 Our Catahoula puppies are proving to have the working ability that is sought after whether it is in the bay pen, woods, working cattle, property protection or varmint control. We are proud to have placed puppies throughout the United States and Canada. 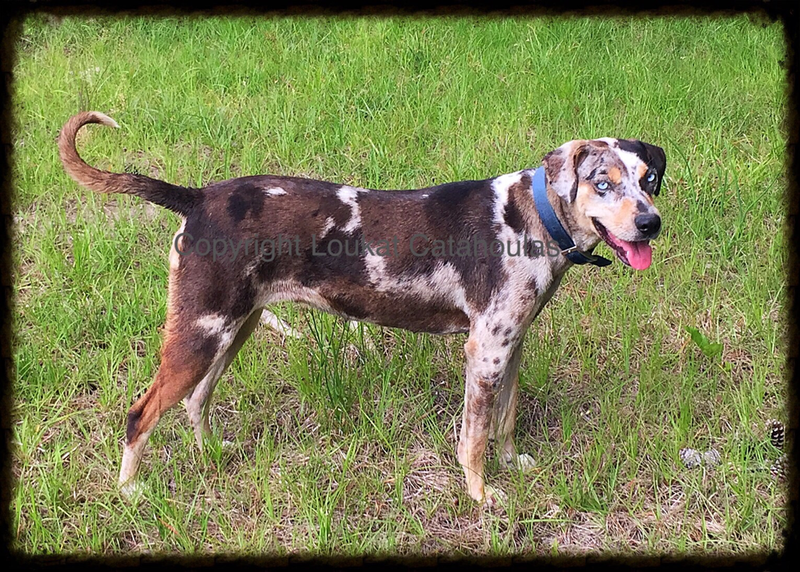 About the breed: The Louisiana Catahoula is a versatile working dog used for working stock, baying/hunting hogs, tracking, treeing, companionship, and guard dog. They are a medium to medium large dog, well muscled, yet trim, powerful and athletic with agility and endurance. 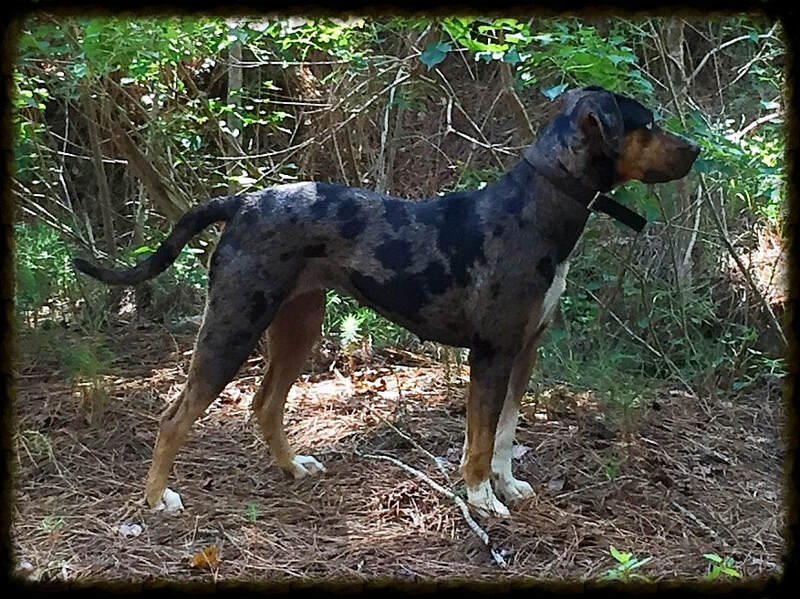 The Catahoula is independent, protective and territorial. They are loving and protective to their family, but may show aggressive behavior toward other animals and strangers. Signs of timidity on a leash should not be taken as cowardice, but the intolerance for strangers. 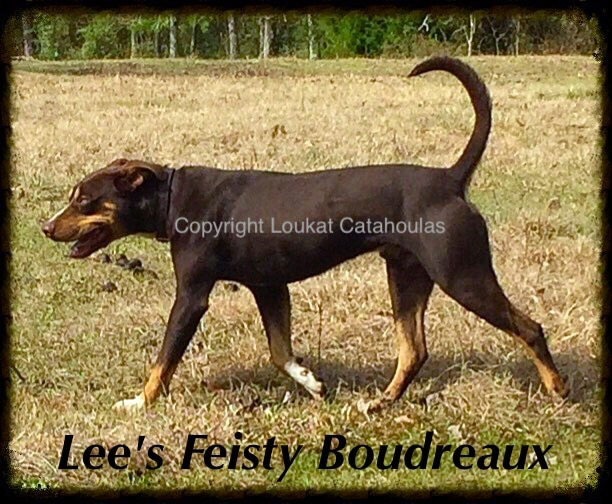 They are a very high energy, working bred dog that requires a job or strenuous activity and thrive in an environment that provides them plenty of room to run. 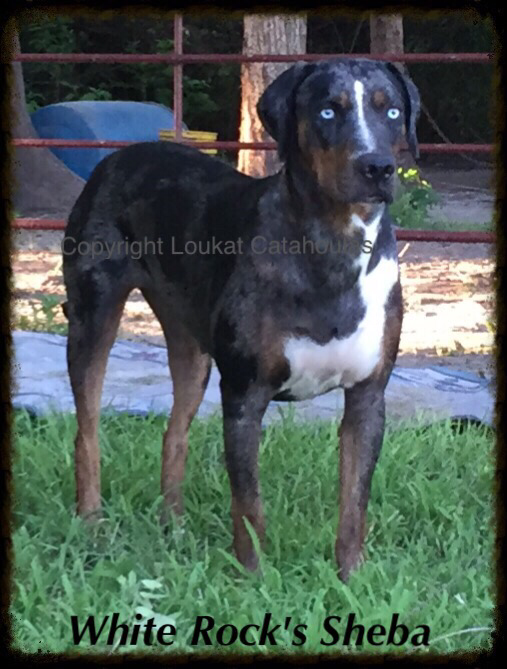 Our Catahoulas have captured our hearts with their loyalty, dedication, strength, determination, and work ethic ~ we can not imagine ever owning another breed! 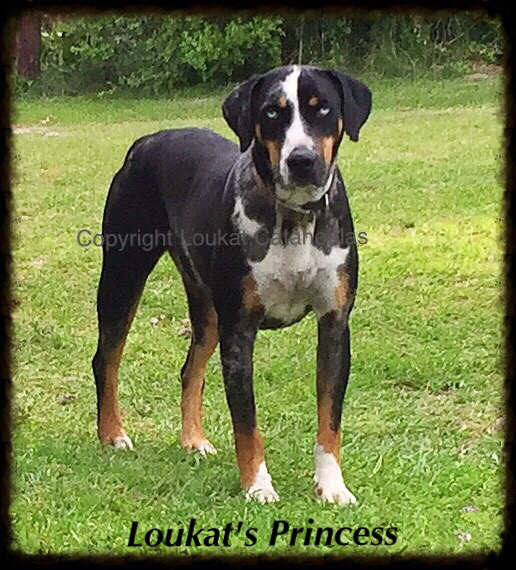 All photos and information on this website are copyrighted material and are either owned by Loukat Catahoulas or being used by Loukat Catahoulas with permission of the owner. Please do not use this information or photos without written permission. Should you desire the use of one of our photos for some purpose, please contact us to discuss you specific needs. The majority of our puppies are on deposit before a litter is born; therefore we will have few puppies to offer the public or offer privately to potential buyers. If you are interested in adding one of our puppies to your home it is best to place your deposit early to secure your place in the pick order. 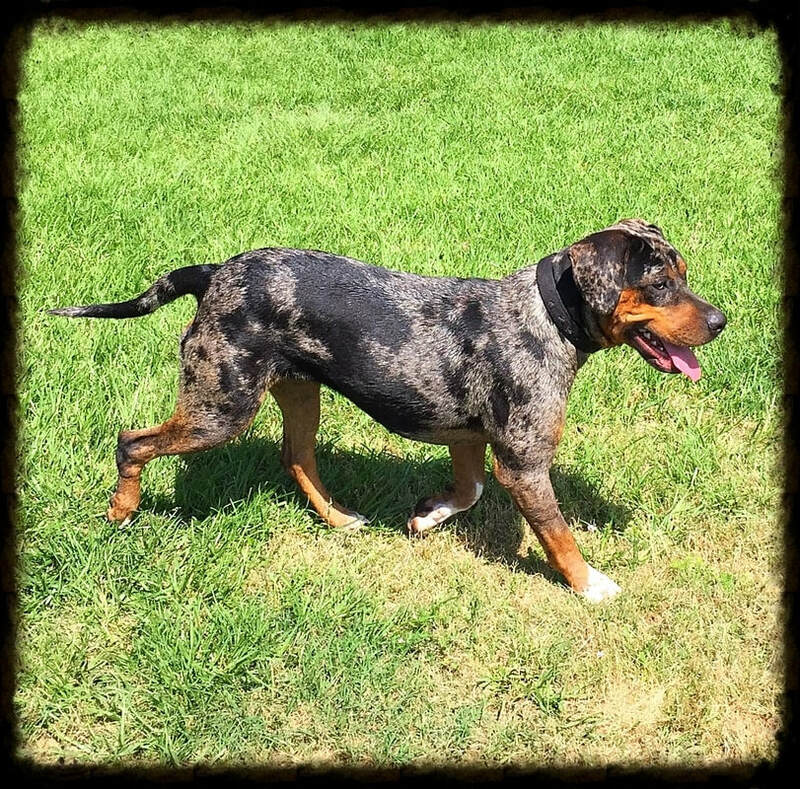 Having long admired, Stones Throw's Drago, it was an easy decision to add Sheba to our program and it quickly became clear it was one of the best decisions we had ever made! 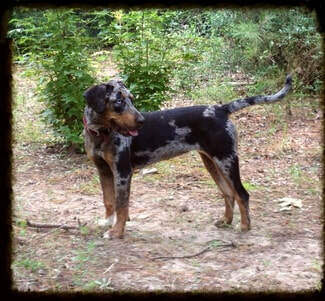 Sheba is the favorite at Loukat Catahoulas. She is intelligent and confident with great conformation. She is assertive, extremely protective of her family and the alpha among our females. She does not back down from anyone or anything. She loves baying hogs and raccoons, working cattle, horses and anything that breathes! She has a great nose for tracking and will eliminate any varmint around. We have not found anything that she won't do if given the chance! ​She has proven to be an excellent producer with puppies exhibiting her same drive, protectiveness and working qualities! Sheba is 5/8 Drago and is a great asset to our breeding program! 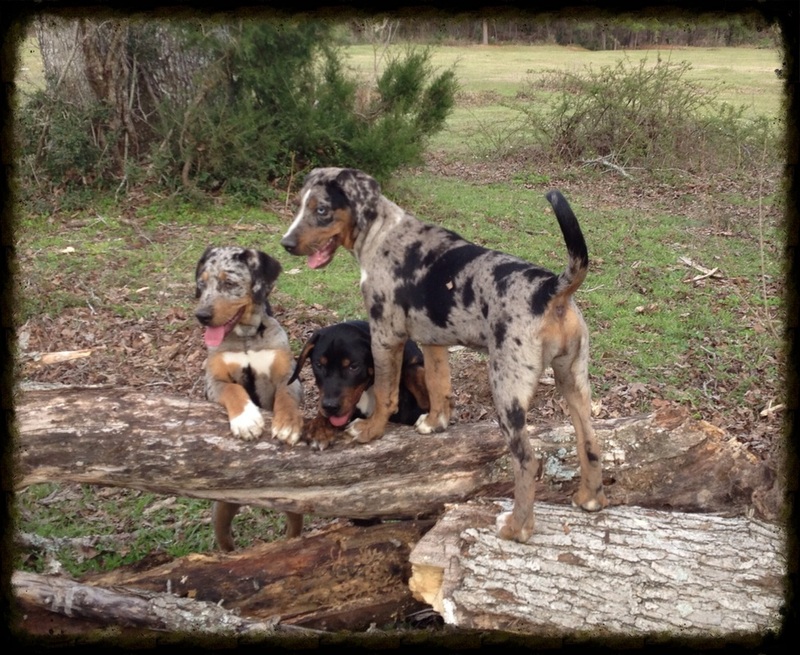 ​We will have limited litters out of Sheba and puppies are on deposit before they arrive. If you are interested in a puppy out of Sheba please contact us for possible planned litters and puppy availability. 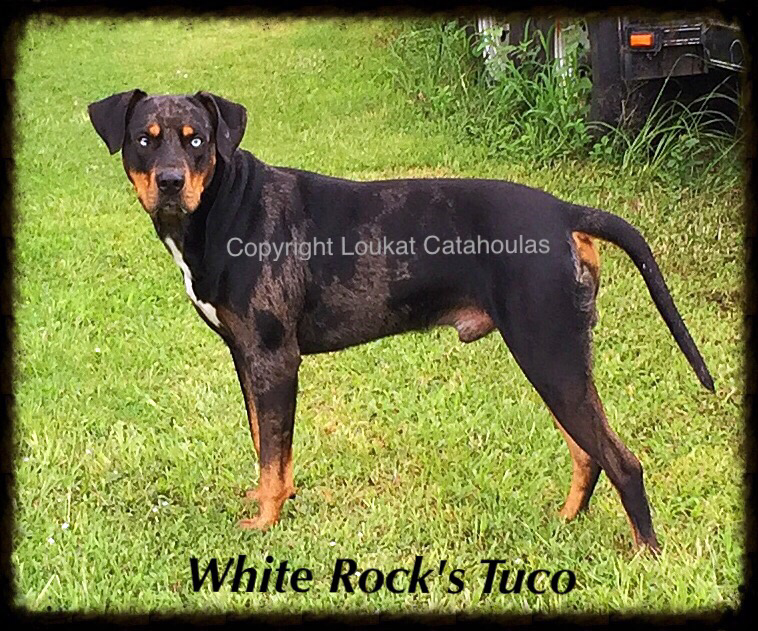 ​Tuco comes from working/champion titled breeding with both sire and dam pointed with NALC. ​Tuco excels as one of our personal protection dogs and he has an excellent nose for tracking along with a strong drive for baying hogs and working cattle. 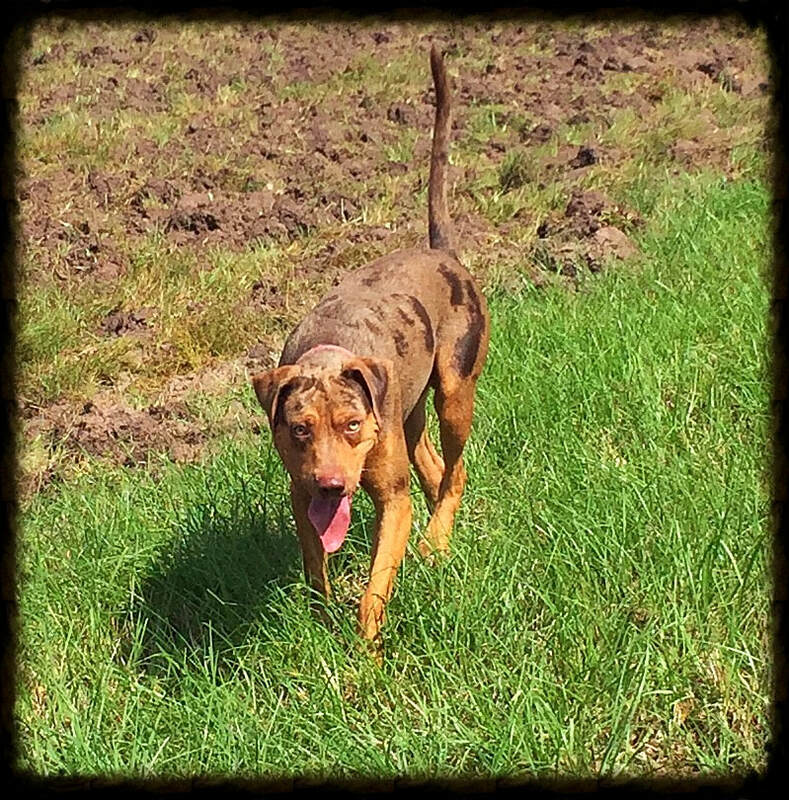 We are very impressed with Tuco ~ he is gritty and determined. 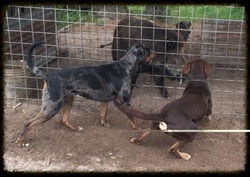 He sired his first litter in 2017 and many of the puppies have exhibited the same characteristics. 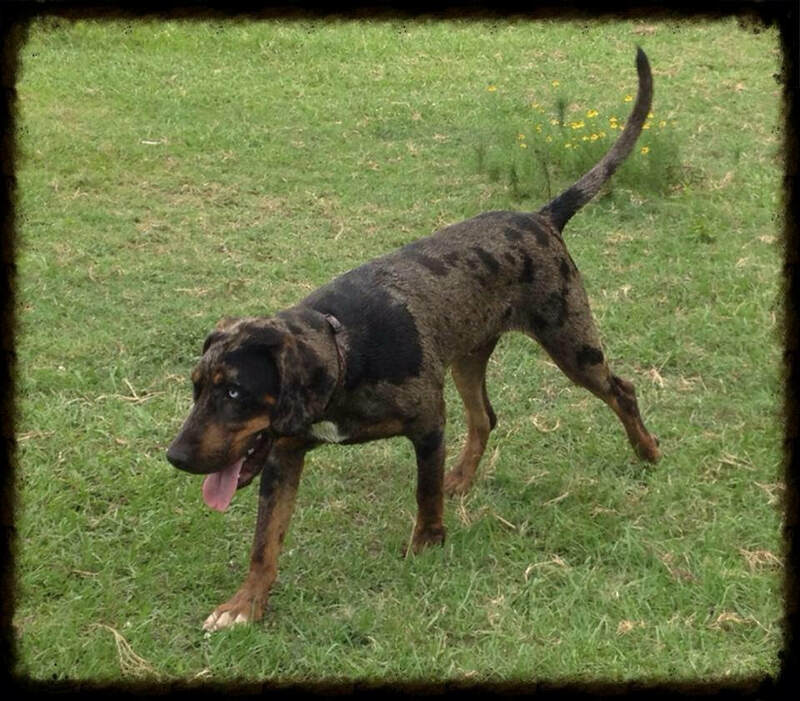 ​Tuco is extremely assertive and the phrases "give up" and "back down" are not in his vocabulary! Merlot has an outstanding pedigree with over 30 Champion titled dogs in the first 5 generations and several more past that. She is out of proven producers of working and titled dogs in the field and the show ring. 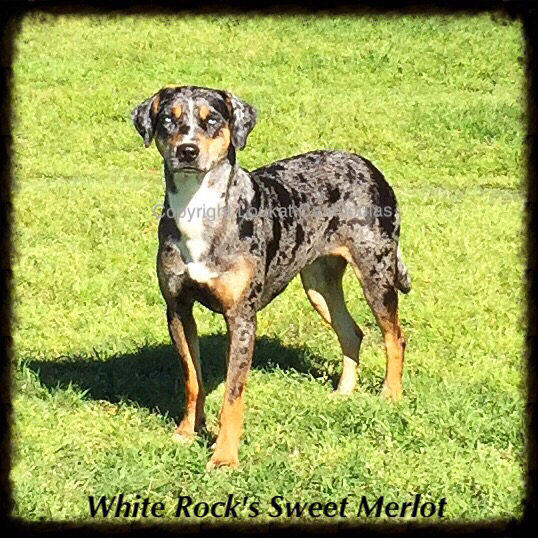 Merlot is intelligent, has a strong drive for baying hogs or herding and hunting. She is determined, gritty and pointed in NALC conformation. Merlot has proven to have the intelligence, working ability, and drive that we appreciate. ** We are pleased to announce Merlot placed FIRST in her conformation class and Reserve in Show at the Sept 2016 NALC show in DeKalb, Texas! 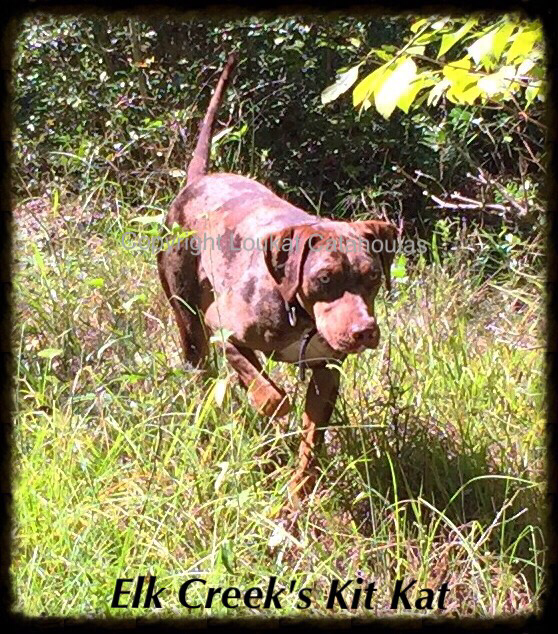 Kit Kat is assertive and has a high drive for baying hogs, herding and protecting. 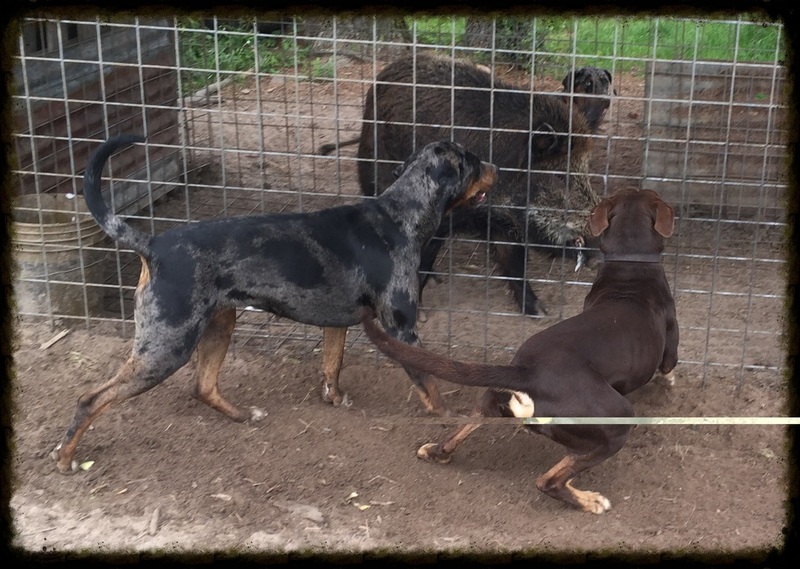 She is out of working and titled dogs in the show ring and field and she is maturing into an excellent working dog. 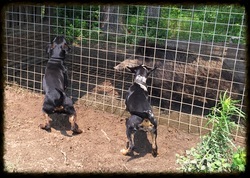 ​Puppies from her first litter were impressive and exhibited the same working drive. We are certainly looking forward to retaining a female out of Kit Kat for our program! Red leopard with tan and white trim. Right eye is blue, left eye is hazel. Boo is an asset to our program and has proven to be an excellent cross on our Drago daughters producing puppies with identical drive and working ability. ​Boo began baying at 4 months old and has a very strong drive for working cattle or baying hogs. He is confident, assertive, and very protective of his family. He has over 4 generations of working and titled dogs. 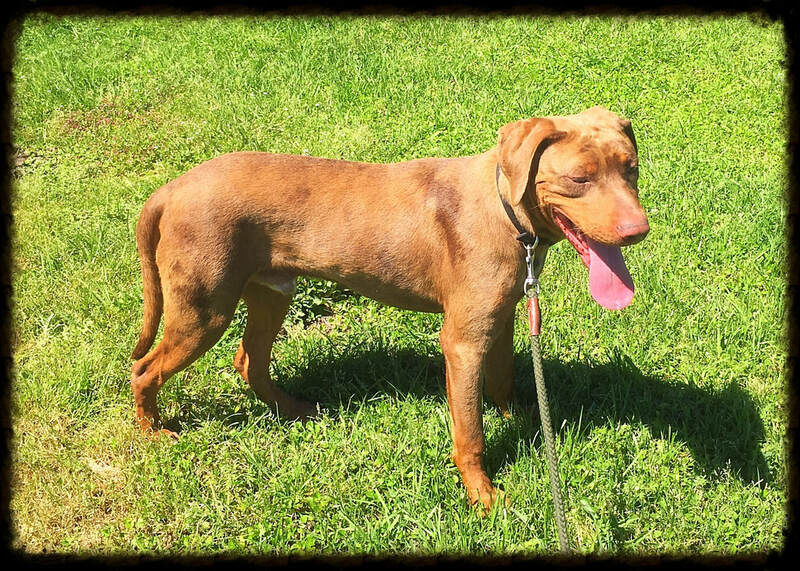 He is a beautiful red with tan and white trim. Both eyes are hazel. We are very pleased to retain this female from Sheba's first litter for our program. ​ Princess began exhibiting the same protectiveness of her sire and dam along with a desire to bay hogs at any early age and she just keeps improving. She loves working anything that moves and is exactly what we strive to produce! She has matured into a large female weighing approximately 70 lbs and is pointed in NALC conformation! ​We look forward to raising more just like her! Princess is a black leopard with glass eyes. We are excited to announce Princess placed FIRST in her conformation class at the April 2018 NALC National show in Carville Louisiana! We are pleased to announce Princess placed THIRD in her conformation class at the September 2016 NALC show in DeKalb, Texas! We are very pleased to add this female to our program. ​Honey is assertive and does not back down easily. She loves baying hogs and eliminating varmints. Puppies out of Honey have exhibited the same high drive working ability as Honey regardless of the sire. ​Honey is a fawn leopard with glass eyes. We were very excited to welcome Ryko to our pack from our February litter out of Razzmatazz and Tuco! 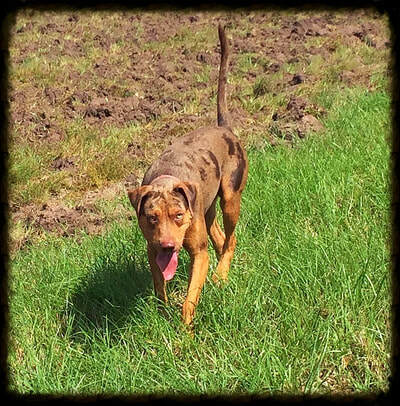 We will be showing Ryko in conformation and he will be started on hogs, cattle and tracking when he is older. 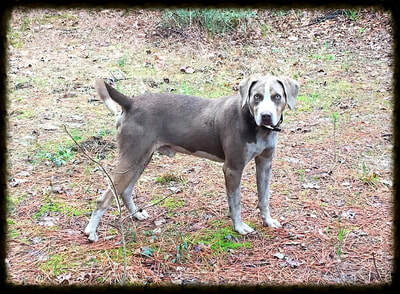 ​Ryko has been color tested and does carry dilute so we can expect future fawn and silver puppies sired by him! ​We look forward to watching him mature and being one of our future sires! 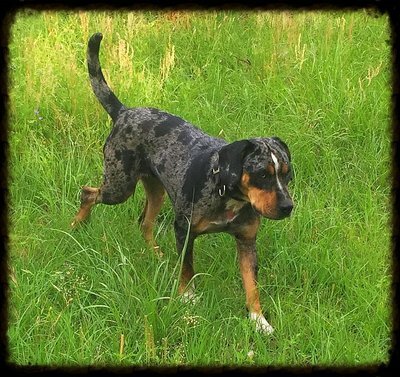 Indy is assertive and has a high drive for baying hogs, raccoons, cattle and for varmint elimination. She has multiple titled, pointed and working dogs in her pedigree and we anticipate her offspring will have the same high working drive that Indy exhibits. 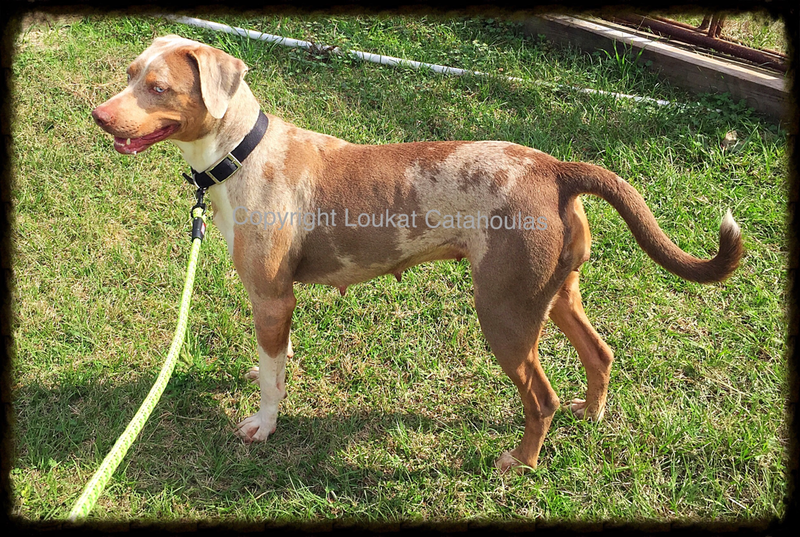 We are expecting her first litter soon by a son of Drago and we believe it will be excellent! 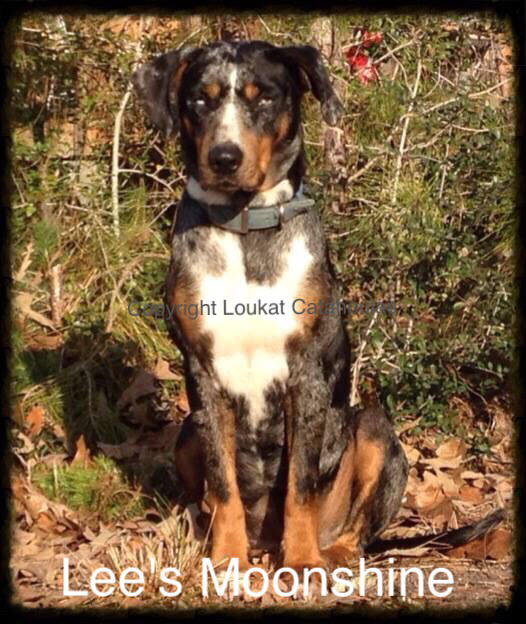 Moonshine is one of our favorite females. She is used for baying hogs or cattle, tracking and she loves exterminating varmints. She has an excellent nose an and best of all she is an excellent mother that loves all puppies, even those that don't belong to her! Her puppies are used on hogs, cattle, for tracking, and personal/property protection. 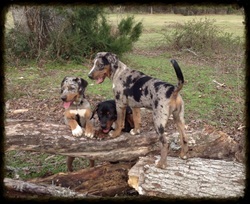 Catahoulas at work and play! 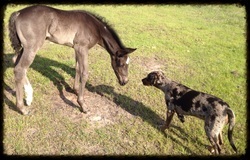 Horses and Catahoulas ~ perfect combination!